Bluegrass and Country Gospel legends The Easter Brothers return with their first release in over a decade. 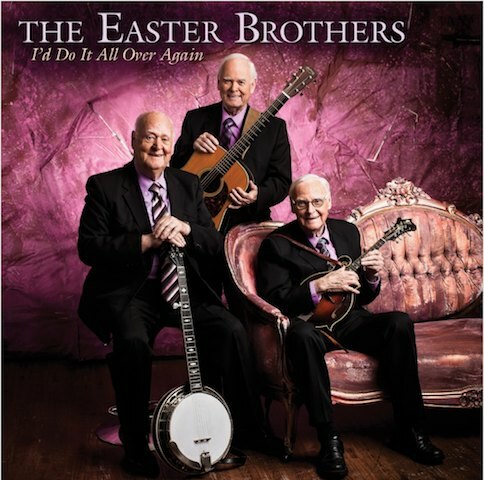 With more than 60 years in music, the iconic Easter Brothers are better than ever on their new CD, I’d Do It All Over Again (Pisgah Ridge Records). After more than a decade since their last recording, fans are eagerly anticipating the new collection from this legendary Gospel Bluegrass trio. Russell, James, and Ed Easter are each accomplished song writers and have been ministering through their music for over 60 years. With decades of iconic recordings, special appearances, and numerous radio and television performances, this longstanding, hard-working music family is widely admired and respected throughout the country, bluegrass, and gospel industry. The Easter Brothers have worked their way to legendary success in the gospel industry following humble beginnings in Mt. Airy, North Carolina in the 1930’s. These enduring artists have collectively written over 300 songs, which include gospel greats such as They’re Holding Up the Ladder and Thank You Lord for Your Blessings on Me. Both of these Dove Award winning classics highlight this very special new album. I’d Do It All Over Again continues a tradition of great original songs performed at a level worthy of the Easters’ lasting legacy. The leadoff track Let the Hallelujahs Roll takes off with the familiar and uplifting Easter Brothers Bluegrass sound. The album continues with many new songs from the three, like You Can’t Judge a Book By Its Cover, The Lost Sheep, the sentimental The Good Ole Days, and the classic-sounding I Didn’t Leave Like I Came. I’ll Do It All Over Again welcomes fans back to the Easter Brothers. It is a fresh and vivid reminder of the gift that has made them legends. Available 18th February, 2014 at Crossroads, iTunes, and AmazonMP3.